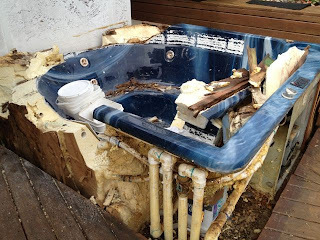 UncleGeorge: How do you remove a whirlpool spa from your deck? In 1991 we set a 7-person above-ground whirlpool spa on a concrete slab then built our deck around it. After 22 years of relatively trouble-free service that spa was falling apart. But how to remove it? Its access from the side of our house is limited; I thought we might have to hire a crane service. 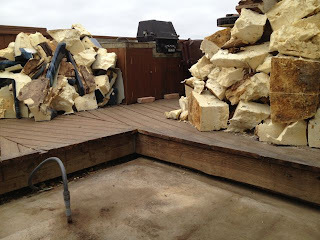 Instead, I used a reciprocating power saw and cut it into cubes that could fit into our (and our neighbor's) trash cans. We've ordered a replacement spa, this one is much smaller ... a two-seater. It can be maneuvered down the side of the house and placed on the same concrete slab. 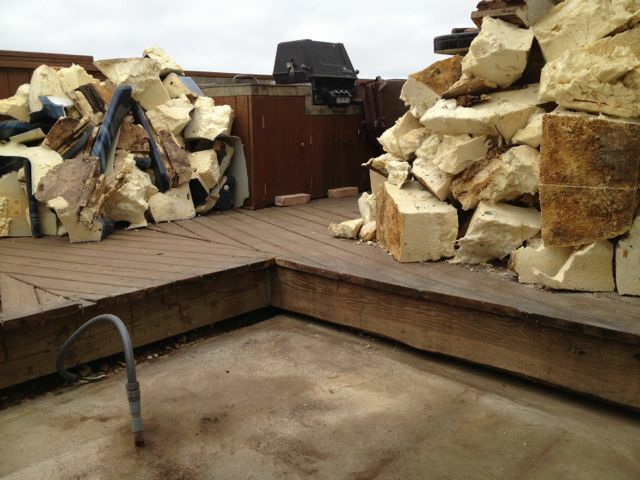 The deck won't be such a tight fit around the edges, but a few modifications will make it safe and accessible. Hope the new one is a long-lived as the one it replaces!